Our range of LED Downlighters. Downlighters are one of the basic elements of good interior design. They cast distinct pools of light onto the surface below. 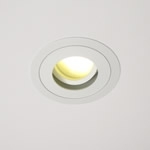 They're usually recessed into the ceiling or mounted on the surface and can be fixed or directional. Our range features fully dimmable LED Downlighter with both leading and trailing edge dimmers. 1-10Volt Dimming Option available, please see individual items for details or better still get in touch for friendly advice.